What better way to celebrate your 55th birthday than to look into the future and project not only what it will look like, but create the future you want today. 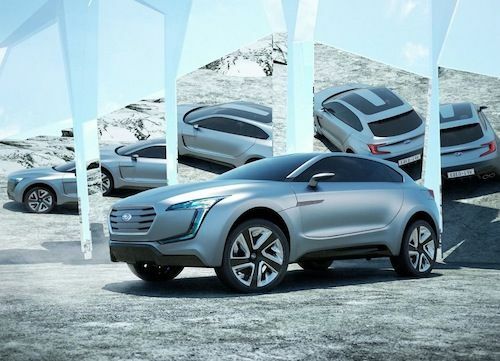 That’s what Subaru has done by revealing the future of their company today with the new VIZIV Concept vehicle in Geneva. The Concept car previews what the future will hold for the Japanese automaker and it’s going to be exciting. For the first time, Subaru will be bringing out a new hybrid car that will launch later this year. The VIZIV Concept could be a preview with it’s hybrid diesel powertrain. It also previews a new compact two-door crossover design that will have enough room for four adults to ride comfortably. The new Subaru design philosophy features cues from the past, and new styling that will launch Subaru into the future. The VIZIV Concept is just over four meters in overall length and features simple and clean surfaces and lines. Subaru says their aim was to “create the ideal balance between a solid-looking body and a condensed cabin.” It looks like the birthday vehicle has achieved the goal. The front and rear of the vehicle still emphasizes the motifs common to Subaru products, but the side profile gives way to a totally new Subaru design element. And the upper cabin has the appearance of a shooting brake body style. The overall design creates a sporty, lean silhouette. The "Mistral Silver Metallic" exterior color has a cool effect that highlights the dynamic, stylish exterior design. The interior also gets a new design courtesy of the new hybrid system. The new hybrid diesel powertrain eliminates the need for a driveshaft which creates a lower floor height that benefits the rear passengers with more legroom. Up front, the driver benefits from an ergonomic instrument panel layout designed that is primarily for ease of driver operation and vehicle control. The cabin also features an instrument panel with tachometer and speedometer in the center with a unique cylindrical design. Subaru even uses a custom information display in the rear to keep passengers entertained and happy. The two-door four-seat VIZIV Concept vehicle is a great way for Subaru to show they are getting younger in their thinking as they turn 55. It showcases a new design aesthetic for Subaru as well as its intent to enter into a segment it doesn’t yet have a presence. But it also shows what the future power of many of their cars will be in the future. The innovative plug-in diesel hybrid powertrain will give them a great power source from which to build their future lineup.